Roger Sermersheim of Sermersheim Farm of Dubois County was among 49 farmers who received the statewide award of ‘River-Friendly Farmer’. The award was presented at the Indiana State Fair on Farmers’ Day, August 15th. The award recognizes landowners and farmers in the state of Indiana for the work the do on their land to protect Indiana’s natural resources. The Dubois County Soil and Water Conservation District nominated Sermersheim for the award based upon his farm management practices. Sermersheim and his wife, Brenda, utilize WASCOB’s, grassed waterways and grassed buffers to keep nutrients and sediment from leaving their property. They have used continuous No-Till with a cover crop system started by his father in 1968. The River-Friendly Farmer Award has been sponsored by 92 local Soil and Water Conservation Districts and Indiana Farm Bureau since 2000. 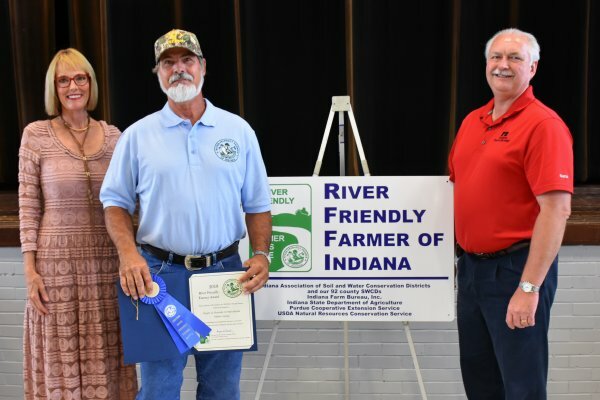 This year’s group of award winners brings the total number of River-Friendly Farmers in Indiana since the award’s beginning to 961. Be the first to comment on "SERMERSHEIM NAMED “RIVER FRIENDLY FARMER”"